So I recently passed the 8th-month mark in my recovery from an ATR. In those eight months, especially in the early going, this site was an invaluable source of information, hope, and motivation. With that in mind, I thought I’d share my own experiences in that it might be of benefit to someone else. I’m a 38 year old male, pretty active but only in okay shape. Before my injury I was typically playing sports (basketball, ultimate frisbee, softball) two to three nights a week. Over the years, I’ve been basically injury free other than the occasional ankle roll, though one year prior I did suffer a minor tear in the same leg. July 14, 2016 – ATR in the closing minutes of an ultimate Frisbee game. Happened while make in a cut at half-speed. Knew exactly what had happened, and went straight to the hospital Emergency. Thompson test indicated full rupture. Put in a temporary splint with foot in plantar flexion. July 18, 2016 – MRI confirmed a full tear with approximately 20mm gap (presumably with my foot in neutral position). Met with the Orthopedic Surgeon who recommended non-operative approach, and was put in a split cast with foot in full PF. February 4, 2016 (3-weeks) – Cast was removed, and was fitted with an Aircast walking boot and 30° heel wedge. The Achilles felt tight in the boot, but it felt great to be out of the cast. Was able to transition to FWB within a week’s time. After two weeks in the boot, started doing gentle range-of-motion exercises and stretching (though never going to neutral), as well as flexing my calf muscle. March 3, 2016 (7-weeks) – Removed one level of the heel wedge, and the next one a week later. Continued with stretching, and gentle exercises. By week 8, was able to carefully walk around the house in shoes. March 17, 2016 (9-week) – Given the okay to transition to shoes with a heel wedge, though still wore boot when walking around outside. Calf felt like jello, and had to re-learn how to walk again. Had a lump of scar tissue above and below the rupture site. Tightness in the lump above rupture location, and the surrounding areas. April 15, 2016 (13-weeks) – Started physio and massage therapy. The massages helped break down the lump of scar tissue reducing tightness and improving ROM. May 26, 2016 (19-weeks) – Given go ahead to start more intensive exercises (e.g. jogging, single leg heel lifts) as permitted without pain. Was told I should be able to run/jump by the next appointment in 2 months. July 21, 2016 (27-weeks) – Hit a recovery wall around Week 22, and stopped seeing steady progress (minimal to no strength gains). Part of this was due to recurring sharp pains in the ankle (not achilles) when I tried to work my calf muscle. Eventually was able to get past the hump by changing up my exercises around Week 25 and started seeing improvements again. Today (~8 months) – Have eased my way back in to ultimate Frisbee over the last few weeks. Still can’t jump, but am able to sprint full out and make hard cuts. Oddly enough, I find that jogging causes more pain than sprinting. Have started doing a bit of jumping (box jumps, skipping rope, hopping side-to-side and forward-and-back). Calf is feeling stronger, and getting more height on the single leg heel lifts. Anyways, that basically sums up my progress to date. I’ll post some more thoughts/details on my recovery later on (e.g., what’s worked for me, and what hasn’t; the exercises I’ve been doing, etc.). 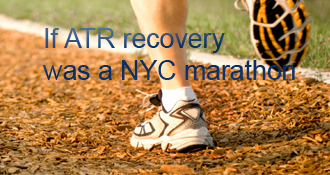 Simon has completed the grueling 26.2 ATR miles to full recovery! That’s for sure. Once I can run again I will try to just put that out of my mind. It is the early jitters while just getting out of the boot, so it’s definitely great reading about people going back to sports from pre-injury. Re-learning how to walk is my daily task now and calf and heel raises. The muscles are coming back slowly just after the week. Once again, glad to see your recovery! I agree, for me current motivator is skiing season. At this point I am hoping to catch the end of skiing season in Feb/Mar 2017. That makes me want to do few extra calf raises and add weight to seated heel raises every day to get these muscles back. Thanks for pointing out ryanb’s blog. Will be checking it out as well. And ryanb, glad to hear that your recovery is a past for you! Hope everyone is recovering well. Rest assured, with hard work, and patience, it does get better. ~4 years out, and I don’t really even think about the Achilles much anymore. Thanks for the blog. It is always interesting inspirational to read about other peoples experiences. There are some crazy people out there. Or the craziest, the 63 year old mountain climber? He climbed mountains for a year with no Achilles tendon. My point is that the sports give people the necessary goal to do the hard work to get back to fitness / strength again. For example I see lots of posts by golfers desperate to get on the course again. My sport is cycling. To give myself a goal I have entered the Cape Argus for the first time. It is a 109km road race. I am told that it is the biggest timed event in the world. 35,000 entrants cycling around Cape Town. March 12th 2017. I’ll be there. My first goal is a 65km race at the start of November. Week 12 may be ambitious. But, I need something to work towards. I might do it with my boot on!!!! The one thing that is certain is that my fitness regime will change. I will do far more gym work and strengthening going forward. If only I knew 2 months ago what I know now . Early on (while I was still in a boot), I was very worried about the possibility of re-rupturing, and whether or not I’d ever be able to get back to the sports I love. Ultimately though, I decided that there is no point worrying about things that are out of my control. Sports are too big a part of my life and I’m not ready to give them up yet. Maybe I’ll reconsider if I have another ATR. In the meantime, I do as much as I can to prevent another similar injury. I focus on exercises to strengthen my calf/achilles (in particular motions relevant to my sports), and on gradually ramping up the intensity when I play. Good luck on your recovery. At around 12-weeks, the big things for me were getting massage therapy which helped break down the scar tissue, and re-learning how to walk/run properly (i.e., activating the calf muscle, and not compensating with other muscle groups). Thanks for the post Simon. I am 12 weeks non-op and am always interested in others that went non-op and reading what worked/did not work for them. Seems like your recovery is going well thus far. Congrats on going back to the sport that caused your rupture. Did you have any fear getting back to it? I am planning to getting back to all my workouts and sports, but I feel I will have to get over the fear of re-rupture at some point in the recovery process. I still have long way to go, but reading successful stories like yours definitely helps! Do post your experience thoughts when you get a chance. si4478’s AchillesBlog is proudly powered by WordPress and WPDesigner..